Just how does sunscreen work, exactly? The chemical makeup of sunscreen, which protects skin from the harmful effects of the sun, is actually quite complex. Much scientific research has gone into developing better sunscreens that cannot only thwart those embarrassing sunburn lines, but also may even help prevent skin cancer. Because lighter skin is more easily sun damaged than darker skin, there are a variety of levels of sunscreen. 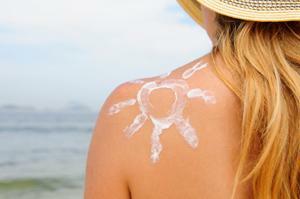 Sunscreen protects using chemical filters, which block ultraviolet radiation. Understanding how these chemicals block, scatter, or absorb UV rays to protect your skin is the first step when trying to figure out just how does sunscreen work. Here are just a few of the chemicals you might find listed on the back of a sunscreen bottle. Paraaminobenzoic Acid - Also known as PABA, this UV filter absorbs UVB, the ultraviolet radiation that causes sunburn. Benzophenones - This organic chemical compound absorbs UVA, an ultraviolet wave not linked to sunburn, but to melanoma, a deadly type of skin cancer. Anthranilates - This chemical absorbs both UVA and UVB. There are several types of organic and inorganic chemicals that also block or scatter rays to prevent radiation from penetrating the skin and causing damage. More commonly known as SPF, sun protection factor is basically a measure of the effectiveness of your sunscreen. It works based on the ratio of the amount of radiation it takes to cause sunburn with sunscreen versus the amount it takes to cause sunburn without sunscreen. For example, by wearing an SPF 15 sunscreen, you won't get sunburn until you've been exposed to 15 times the amount of radiation that would normally cause your bare skin to burn. However, there are some factors to consider when it comes to SPF. SPF ratings only apply to the amount of UVB radiation your skin is absorbing, because that is the radiation causing sunburn. SPF ratings have nothing to do with the type of radiation that causes skin cancer, so it's important to check that your sunscreen protects you from all types of UV. Sunscreen is most effective when it is applied 30 minutes before engaging in an activity that will expose you to ultraviolet rays. This measure of time allows the cream or lotion to actually bind with the skin to protect it. Swimming or sweating can cause sunscreen to wash away, so be sure to towel off and re-apply sunscreen often. Sunscreen has a time limit even when you aren't sweating or swimming, so be sure to re-apply every two hours while you are out in the sun, regardless of activity. While there are many upsides to wearing sunscreen, it's also important to note that the sun does provide vital doses of vitamin D for the skin. Vitamin D is needed by the body to promote strong bone health, among many other important jobs in the body. Because sunscreens with high SPF block or absorb much of the UVB, they also block the body's absorption of vitamin D, which can cause a deficiency. Vitamin D deficiency can cause rickets in children and osteomalacia in adults. Deficiency can usually be prevented by eating a diet rich in vitamin D. If you are concerned about vitamin D deficiency, talk to your doctor. Don't let enjoying the sun today jeopardize your future. For more information on sunscreen and the role it plays in skin cancer prevention, visit the Skin Cancer Foundation website.